Whether you're buying or selling tickets on our site, Will Call safeguards your entire transaction from fraud and other dangers with our worry-free guarantee! If you see a starburst symbol (*) next to a ticket listing, that means the seller of those tickets is so confident in the quality of their tickets that they’ll offer a 150% money back guarantee on your order. 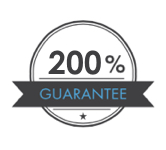 Our worry-free guarantee means you're absolutely secure! Will Call operates a rating system that ranks the sellers who resell tickets through our Exchange based on past order behavior and purchase efficiency. We use this system in order to ensure that our customers are treated as responsibly as possible by the sellers in our network. We expect the very best service for our customers and constantly review ticket sellers in order to ensure they provide the best possible service! The rating system detailed above is individualized for every ticket seller and calculated on a systematic basis with hundreds of behaviorally-triggered touch points. The ratings for ticket sellers are therefore constantly in flux and constantly updated so as to ensure consistently superior service for Will Call customers. We at Will Call reserve the right to limit the rights of sellers to sell tickets through our Exchange in response to any customer service situation. Penalties in this regard can range from fines imposed by Will Call to outright exclusion from our marketplace. Sellers therefore have every incentive to treat our customers with respect. You’re always protected when you order through Will Call! Will Call guarantees that the following will be true for all event tickets ordered through WillCall.com. All the tickets sold on Will Call are guaranteed to be authentic tickets valid for entry to the event concerned. Customers should contact their ticket seller ASAP if there is any problem using their tickets at the venue. Customers need to access evidence of invalidity from the venue in those cases when the ticketing issue is not resolved. Will Call requires this evidence in order to obtain a refund from the ticket seller who supplied the order. The evidence could range from a letter from the venue or even a simple email identifiably from venue personnel verifying that there was a problem scanning the tickets. Will Call expects the sellers who list tickets on our Exchange to provide the seating they advertise or else provide equal or superior seating. Sellers are expected to contact customers proactively to confirm any significant seating changes vis-à-vis the initial section and row of a ticket order. Customers should contact Will Call ASAP if they are unhappy with any alternate tickets and we will investigate the issue for the customer in order to reach an amicable conclusion. All deliveries are made to the address listed by the purchaser in the appropriate textboxes during checkout. We guarantee that the tickets will be shipped to the purchaser in sufficient time so that at least one delivery attempt is made before the event occurs. Please note that the purchaser is responsible for making himself or herself available to receive delivery of the tickets when a delivery attempt is made. Will Call will coordinate with the ticket seller for compensation in those cases when sellers do not ship or do not otherwise deliver tickets in time for customers to access them for the event. Will Call will coordinate with the selling broker to provide the purchaser a full refund of the ticket order, excluding delivery fees. Please note that the ticket seller may require the purchaser to return the tickets prior to issuing a refund.